Location/suburb of testing? Relative signal strength of each network? Milford and Devonport :-) Not sure about signal strength, would need to find that out. But that's the average from the two sites. Will try coverage next, 2 degrees is terrible. Lurch: Milford and Devonport :-) Not sure about signal strength, would need to find that out. But that's the average from the two sites. Have you checked that your phone supports 900MHz 3G? As there are some spark / skinny phones out there that only support 3G on 850MHz and 1800Mhz. These phones will work well on spark / skinny. But will have poor coverage on 2degrees. During my brief re-try of 2degrees I found it hopeless around the shore from beach haven thru to albany and across to mairangi bay. The few trips I did over to ellerslie/penrose way were not terrible. If my phone had an option for 3g/4g only then I might have been ok with 2degrees, but I kept finding one phone was on edge when the other was on 2-3 bars of 3G. I've found here I have constantly good performance on Spark, switched to Skinny and it has been the same. For what the average punter does it is totally fine. I'm assuming you'd switch telcos based on significantly more than once off speedtests in some locations. This should be a very low factor in someones decision due to how woefully irrelevant it is. 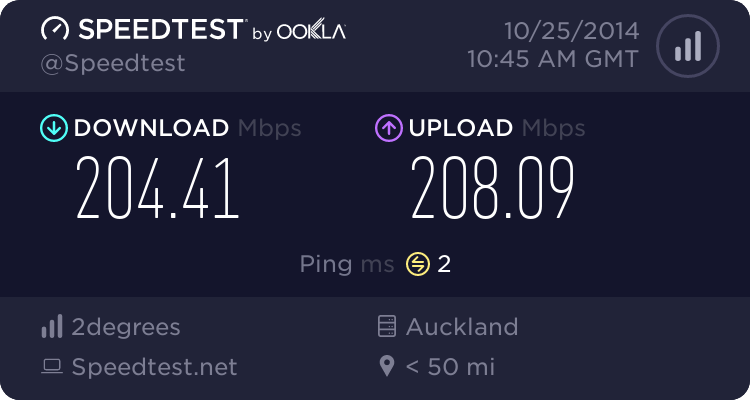 A better gauge would be testing each out, and gauging the real world experience - speed of page loads, photo uploads, video streaming performance - i'm guessing you've done this to some extent, but your post you've written reads like a simple "vodafone has the faster speedtest, im going with them". As you've indicated, network type and signal matters a lot too. If this thread isn't packed with science, I don't know what is.